Great vacation, but it’s also nice to be back home again in my own kitchen. For no particular reason other than it was Martin Luther King Day on Monday, I made (and want to share with you) a delicious and wholesome lunch. It was a cold day that was reminiscent of March in Paris, and my thoughts went immediately to bistro food. 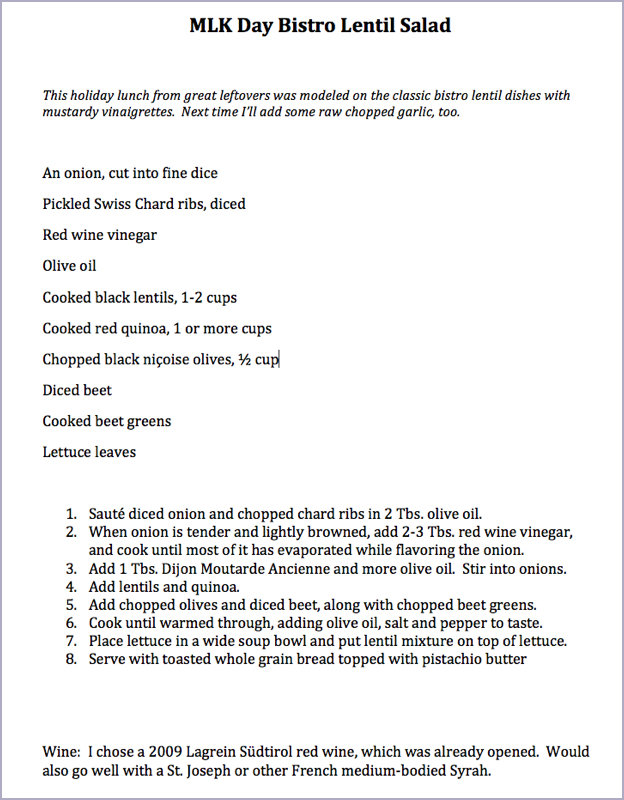 The dish that came about as a result was a salad of organic black lentils, red quinoa, beets and beet greens, and nicoise olives, all melded nicely with a mustardy vinaigrette, on red leaf lettuce. Some of my pickled chard ribs added a nice bit of tang to the salad. An extra fillip was some whole wheat sourdough toast with pistachio nut butter for contrast. This entry was posted in Food, Vegan, Wine. Bookmark the permalink.